Charita Stubbs hails from Cleveland, Ohio. She moved to Tucson in 1990 to play volleyball for the University of Arizona. She was the first player in Arizona history to record 300 kills, 300 digs and 100 blocks in one season. In addition, the former Charita Johnson led the Wildcats to back-to-back Sweet 16 appearances at the 1993 and 1994 NCAA Tournaments. She was a four-year starting middle blocker from 1990-94, earned All-Pac-10 and All-West Region honors as a senior, and still holds school records for career (117) and single match (8) solo blocks. Charita was also a member of the 1993 and 1994 United States Olympic Festival volleyball and she played professionally in France in 1995. Charita earned a bachelor of arts degree in political science from the University of Arizona in 1994 and received her master's in language, reading and culture from Arizona in 1995. She is fluent in French and is a certified teacher. Charita joined the University of Arizona coaching staff in 1996 as an assistant coach. In 2000, she was named Arizona's associate head coach. During her time at Arizona, the team reached the NCAA Tournament all nine years and finished in the top 25 in all but one of those seasons. 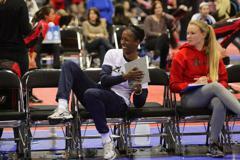 In 2006, Charita was named the head volleyball coach at NC State. Charita was the head coach at NC State for four seasons. She then went on to found and direct Club Red Volleyball in Raleigh and was the Athletic Director and head volleyball coach at Grace Christian School in Raleigh. Charita returned to the University of Arizona coaching staff in 2013.
worked as an assistant volleyball coach at the renowned High Performance Camp in Salt Lake City for two summers. served as an assistant coach for the U.S. Junior National team that qualified for the 2001 World Championships in Mexico. won a gold medal with her team at the 2017 USA High Performance National A2 Invitational in Colorado Springs. Charita is a CAP II certified coach and is a graduate of the Women’s Coaches Academy (WCA). She graduated from Emory in 2005, and followed up with WCA Dimension II Inverness in 2007. A lifetime member of Delta Sigma Theta Sorority, Inc., Charita is very involved with her church, Mt.Calvary. Her community involvement is also demonstrated with her involvement with Goodwill as a board member. She is married to Melvin Stubbs and they are the proud parents Melvin Jr. and Bethaina. Charita coached with Zona from 2000-2005 and then returned to the Zona staff for the 2015 club season.